Rhianne Menyon is just months away from her 20th birthday and as the eldest sister, she is due to marry. Rhianne however is far more interested in painting in her fathers pottery shop despite the fact that isn't suitable work for a woman than tying herself to a man. Marriage as it turns out is the least of Rhianne's worries. One night she dreams that the dragon who rules the castle high in the mountains has put out a banner signalling that it is now the duty of the town to provide him with a wife. Given that there will be 100 young women in the lottery, Rhianne believes that the odds of not being selected are in her favor. When Rhianne's engaged best friend is selected in the lottery, given her lack of prospects, Rhianne decides to take her friends place. This could very well be a death sentence but the 1000 gold coins that will be paid to her family will keep them in comfort, even if it does land her in a cold grave. I'm all for fairy tale re-tellings because the good ones are creative and add something new to a story that a reader is overly familiar with. As you may have guessed, Dragon Rose is a version of Beauty and the Beast. Unfortunately however, Pope adds very little to the story to distinguish it from the original . There isn't a tea cup named chip or excessive singing but it's just as saccharine as the Disney version. The changes are so insignificant, it's enough to make me wonder why Pope bothered at all. Obviously, Rhianne is now dealing with a dragon instead of a beast; however, this change adds nothing to the story and feels random for the sake of random. Theran (the dragon) acquired this condition because he told a young woman that he wasn't into her and she responded by taking her life. What Theran didn't know is that the young woman's father was a mage. The mage decided to punish Theran by turning him into a dragon until he could find a woman who could see through the horror of his being to who he truly is. What is the moral here? In the original, the Beast was turned into a beast because of his mean and horrible behaviour; it was a teaching lesson. What exactly did Theran learn from being turned into a dragon for five hundred years? Theran's mistake was simply not being into someone, that's it. You would think that given the boring way in which Theran became a dragon that we would at least have an interesting reveal but you would be wrong. Pope drops it all in the last few pages of the novel, once he is cured by seeing Rhianne's painting of his pre-cursed self. This is particularly irksome after Theran went on a big rant about how they aren't living in a fairytale and that Rhianne cannot simply change him back with a kiss. Rhianne is another super special snowflake protagonist which essentially means that she's special because Pope says so. Yeah Rhianne can paint which is a skill most women do not have in Pope's world and she has dreams about the future but beyond that, her personality isn't really developed. By the end of the book, I still don't feel like I know who she is. There's nothing that sets Rhianne apart from so many other YA protagonists. 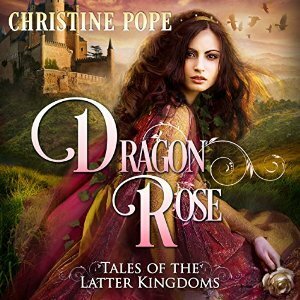 If you're looking for an interesting re-telling of a classic fairytale, Dragon Rose is not for you. It's about as exciting as over salted cold porridge. Pope essentially goes through the motions, chugging along to the completely predictable conclusion, leaving the reader wondering why they picked up the book in the first place. If you're already familiar with the tale of Beauty and the Beast, there's absolutely no reason to read Dragon Rose.